Tom Horsfall, 17, who has been a member of Austwick Tennis Club from the age of eight, is now ranked the number ten player in Yorkshire. Following a successful summer season, Tom has climbed up the rankings from 5.2 to 3.2. 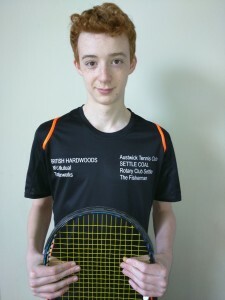 After winning several age group competitions earlier in the year he started September by reaching both the Yorkshire County under 18 singles semi-finals and the men’s doubles semi-finals. Meanwhile Tom continues to play for Austwick A team in the Wharfedale League mixed doubles and in the 2018 season won all but one of the 27 rubbers he played.